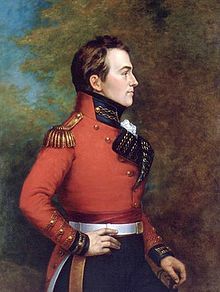 Congratulations Sir Isaac Brock. Royal Canadian Mint has issued a commemorative quarter in your honour. Your allies at Maple Sandbox congratulate you on this great honour. We hope together we will be as successful in resisting the attempted 2012 American invasion into Canada as you were in 1812. « Are expats America’s laziest voters? Thanks for posting this, Blaze! I hope the tails side has a burning white house. They are only issuing 10,000 of these $4 coins, which is a relatively limited edition. 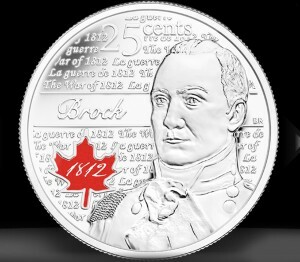 You can get them at the Mint’s website here http://www.mint.ca/store/coin/fine-silver-4-coin-sir-isaac-brock-mintage-10000-2012-prod1550020 for just under $59 Cdn including shipping, handling and tax (if shipped in Canada, probably more outside Canada). Not sure when Blaze found the photo, but it’s inflated from a quarter to a $4 piece, I can’t find a quarter anywhere on their website. For the same price, if you’re interested, they also have a very similar $4 coin (same 10,000 production run) in honour of Tecumseh, which is nice to see — the First Nations contributed as much to repelling the Americans as did Brock and the British (there was also a Canadien leader whose name alas I can’t recall at the moment, who was instrumental in repelling the American attack on Montreal, rather unfortunate oversight on the Mint’s part, I can’t see a coin in his memory. *Charles de Salaberry at the battle of Chateauguay. Unfortunately the site is virtually ignored. The Mint has also issued circulation quarters, at their website if you drill further than I initially did you’ll find you can order a set of 10 quarters for $2.50 (face value price, unusual for mint orders) and free shipping in Canada. The $4 coin is larger than the quarter, about the size of a silver dollar (27mm diameter). So the Mint has issued TWO coins commemorating Brock, a quarter and a $4 proof coin. Tecumseh only gets the $4 coin, and poor de Salaberry is out in the cold for now. Though the Mint’s description of the $4 Brock says it’s a $4 coin to commemorate “the four leaders.” Well now we know of two of them, Brock and Tecumseh, no sign yet of the other two. One hopes de Salaberry will be a third in a future release. Wonder who the fourth is, probably a Loyalist who fled the US after the revolution, but no odds on who that might turn out to be. Would be nice if it were a Loyalist; lots of us on this website can identify with people who fled the US and came to Canada (I certainly can, anyway!). @Patricia Glad to hear this!! Just dug out my old Pierre Berton books about the war; Berton says Secord was the daughter of a Loyalist family. Not clear to me on which side of the border she was born, but I know several Candian 30-and-40-somthings who are children of US expats who can identify with that. Hmm, I wonder if the Mint and the Laura Secord company will issue a complementary chocolate with the coin? Though I must confess I’ve always preferred Rogers chocolates (Victoria BC) to Secord chocolates, but still chocolate is chocolate. The Canada Post offers combined Major-General Isaac Brock and Chief Tecumseh stamps and also the silver $4 Isaac Brock coin. International shipping is available. Search on “Isaac Brock” at http://www.canadapost.ca for the offering. Perhaps Petros might wish to set up an Isaac Brock on-line shop complete with coins, stamps and, of course, t-shirts, caps and umbrellas. They would make perfect gifts to that special US Vice-Consul giving us our walking papers. One has to wonder how many inadvertent hits IBS is getting because of the issuance of these coins and stamps? @bubblebusin Interesting question. The more hits the merrier; the more Canadians who learn about what the US wants to make Canadian banks do (in violation of Canadian banking and privacy laws) the better IMO. You know how the US Military is about “challenge coins”. I think we Brockers need one. An Isaac Brock challenge coin. Slam that down on the counter when we go to renounce our U.S. citizenship. Canada Post delivered my $4 Brock silver coin in today’s mail. The website says they will be minting only 10,000 of these coins. The certificate that came with mine says it is number 7686. Assuming that all the lower-numbered coins also have been sold, that suggests the coin may sell out fairly soon. If you’re interested in this coin as a Brock souvenir, don’t delay ordering. The Brock quarters are going to be released for circulation and in much larger numbers, so they should be available for longer than the $4 coin. You can always just wait until you get one in change (if you live in Canada), though it won’t be in uncirculated condition if you’re a coin collector. As a souvenir, though, even a circulated quarter has value. Bear in mind that only about half the quarters being minted will have the red maple-leaf “1812″ logo insert on the coin, so if you get one of those in change be sure to hang onto it, they’re going to be rarer than the ones without the insert (as they’re more likely to be snatched out of circulation than the former). Would the US consulate take 450. in Brock quarters for the renunciation fee? @Petros. Great song! Wonder if we can convince the Mint to start shipping copies of it, or at least printing a link to it on the insert with the War of 1812 commemorative coins? 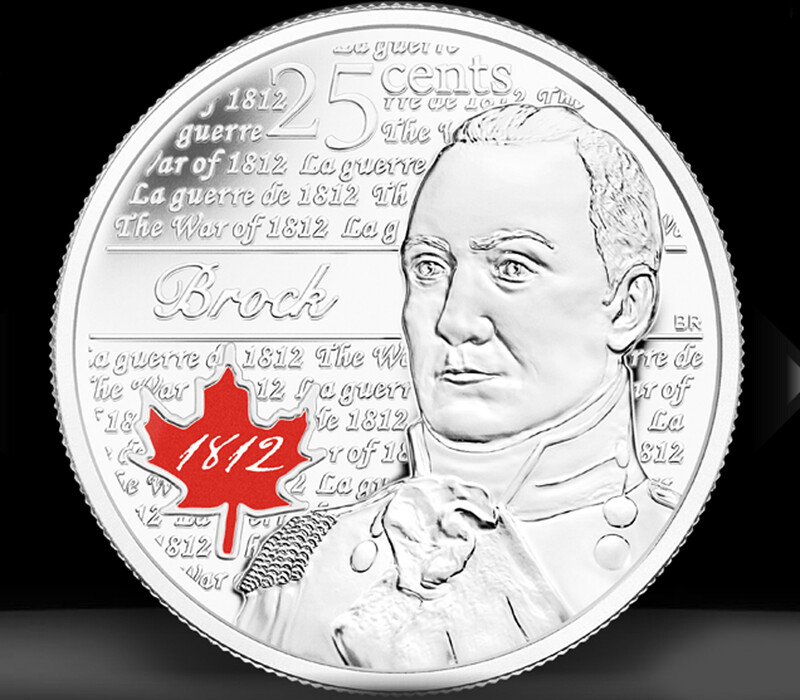 There is another Isaac Brock commemorative coin – The Brock Memorial Foundation is being supported by ‘Brock by Brock’, a commemorative fine silver medallion designed by Sir Isaac Brock’s 1st Cousin and minted in the island of his birth. For those into comparatives, the Brock by Brock medallion represents 1 troy ounce (31.8g) of 999.9 silver at £45.00 +p+p, whilst the Canada Mint coin is only 7.96g at CA$ 49.95 – quite a difference in value. @Oliver, thanks so much for commenting and informing us of the handsome medallions that are available at your site. It is an honor to have a living relative of the man who inspired our website make a comment here. Cheers. Thank you Petros, living in Guernsey we also have a number of US citizens who are less than happy about the US government’s latest changes to their taxation strategy. The aims of your society are admirable, and I wish you all the best with your efforts. Thank you also for posting one of our pictures, we are very proud of our ancestor and wish to celebrate his legacy far into the future..! *@Petos: Both the Brock name and the Peter Dunn name are famous. Do you know New Zealand’s Minister of Revenue is called Peter Dunne?. First it was Pete the Planner grabbing on to your name, now it is a New Zealand Cabinet Minister Pursing FATCA Agreement. I suspect you will not be pleased at what your namesake is doing!